‘Seemingly nothing in this world daunts the young criminal mastermind Artemis Fowl. In the fairy world, however, there is a small thing that has gotten under his skin on more than one occasion: Opal Koboi. In “The Last Guardian,” the evil pixie is wreaking havoc yet again. This time his arch rival has reanimated dead fairy warriors who were buried in the grounds of Fowl Manor. Their spirits have possessed Artemis’s little brothers, making his siblings even more annoying than usual. The warriors don’t seem to realize that the battle they were fighting when they died is long over. Artemis has until sunrise to get the spirits to vacate his brothers and go back into the earth where they belong. Can he count on a certain LEPrecon fairy to join him in what could well be his last stand? Now first of all, if your a fan of imaginative storytelling coupled with great, original characters and an action packed plot and haven’t picked up the Artemis Fowl series, you’re mad. It is just such an interesting concept, coupling fairy myth with science and it really works. I was drawn into Artemis’s (The most likeable unlikeable main character ever) world immediatley and that is why I couldn’t wait to read the last guardian. Now, I am not saying that this series is perfect, the plots do start to get a bit samey and I do prefer the earlier books, but Eoin Colfer’s talent as a writer really carries the novels, and I for one couldn’t put them down! In The Last Guardian, we begin with Artemis finishing his counselling treatment for his Atlantis Complex that he discovered he had in the previous book when almost immediatley the biggest threat to fairies and humans starts to occur. See – Action packed! Opal Koboi, the evil pixie genius has her younger clone murdered so she can become the most powerful pixie ever and unlock two ancient gates, (that happen to be in Artemis’s house) that will bring murdered fairy soldiers back to life under her control and destroy the human race! Of course Artemis, Holly, Mulch, Butler and Foaly are determined to stop her from achieving her crazy goal. Artemis is his usual, uber intelligent, confident in his abilities, slightly verging on the arrogant, but with just a smidge more humanity then he had in the first book. He is one of my all time favourite characters, because he is a character that I want to dislike, but he is written in such a way that makes him loveable. I think what I look most for in middle grade series is that growing up aspect, and Artemis has done that over the course of 8 books. Butler is still his steadfastly, loyal bodyguard and a few of his lines made me chuckle in the novel, although I do wish he could have seen a bit more of the action. I absolutely loved the sub-plot about Foaly and his wife – it was funny and we got to see Foaly in a different light and not chained to his deck, but I would have liked more interaction with Artemis and Holly. Holly, who wanted to be when I was younger, is still a feisty, brave LEP Officer and Mulch is still wizard with his wind! 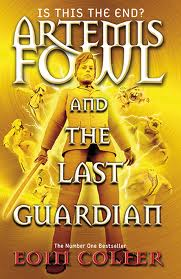 Now, the plot is just a tad samey, and for me, its not the best Artemis Fowl book but once you get so far into a series you have to finish it. I would have liked a tad more Holly/Artemis loving (I’m a sucker for romance at the mo!) but I have to say, the ending blew me out of the water. Eoin Colfer really is a genius. I cried, and it takes me a lot to cry at books (even at books I love!). Although I am sad to see Arty go, I am very excited to read the new series from Colfer, W.A.R.P, which comes out next year. Also, I wanted to read Artemis Fowl when I was younger, but my sister liked it so I refused to read it in the end – just to annoy her. Great post. Hello – sorry its taken me so long to reply, I would love to do your tag! The link isn’t working though.